Just because a child is in school does not mean he or she is learning. 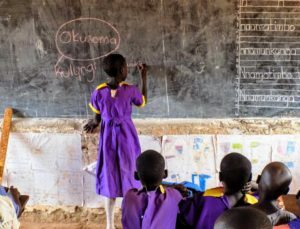 In Uganda, where third grade students were recently asked to read a simple sentence such as “The name of the dog is Puppy” in English or Kiswahili, three-quarters did not understand what it said. What’s more, these learning outcomes don’t seem to improve as time goes on. 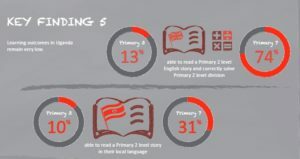 Almost 70% of students at the seventh grade level (the final year of primary school in Uganda) still couldn’t read a second grade level story even in their local language. The answer is not an easy one, but an evidence-based approach called Teaching at the Right Level (TaRL) is making waves in the education space as rigorous impact evaluations over the past 17 years have consistently demonstrated its effectiveness in improving learning outcomes related to basic literacy and numeracy. Pioneered by Pratham, a large NGO in India, the approach has already improved learning opportunities for more than 47 million students and has educators begging the question of whether the approach can work in a place like Africa, too. If it can, TaRL has the potential to improve the learning outcomes and futures of millions of primary-age children throughout Uganda. Building Tomorrow is helping to answer this question through its recently concluded TaRL literacy pilot program, which demonstrated remarkable gains in student reading outcomes in just 25 days and provides insights into the approach’s application in the Ugandan context. Teaching at the Right Level (TaRL) is an evidence-based approach that moulds classroom instruction to a child’s learning level. The crux of the approach is grouping children according to their learning levels, focusing on basic reading and mathematics skills, and targeting instruction to a child’s current level. In other words, a child’s learning level is not assumed just because he or she is in a certain class; it is first assessed and then acted upon. The approach meets children where they’re at, rather than where they should be. TaRL lessons break free of “chalk and talk” practices commonly found in primary classrooms throughout the world by encouraging the use of engaging, child-centered activities. Rather than following an over-ambitious uniform curriculum, the program addresses children’s current learning gaps and focuses on building core foundational skills. How did Building Tomorrow implement its TaRL pilot program? At a TaRL workshop before the start of the pilot, teachers practice leading students in a mind mapping exercise, whereby learners come up with a word, then identify related words and practice forming sentences, paragraphs, and full stories together. Mind mapping is one of the simple interactive activities used to guide and encourage children in writing for TaRL. Building Tomorrow’s TaRL pilot program was implemented as part of our Thriving Schools Program, a community-centered initiative led by Building Tomorrow Fellows and teams of Community Education Volunteers (CEVs) aimed at providing primary-age students with access to an inclusive, quality education. 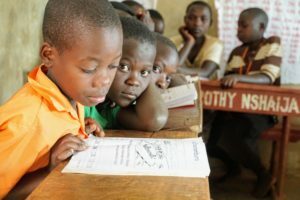 Through the Thriving Schools Program, Building Tomorrow recruits and trains recent Ugandan university graduates as Fellows and deploys them to rural communities, where they aim to transform underserved schools into Thriving Schools. Building Tomorrow’s TaRL approach borrowed elements from several successful Pratham models. In our intervention, TaRL lessons took place at a dedicated time during the school day and were implemented by both teachers and Community Education Volunteers. Similar to the successful program implemented in Uttar Pradesh in India, the model involved high-intensity, short-burst periods of lessons, with 25 days for literacy and, in a future pilot, will involve 25 days for numeracy. Additionally, since monitoring and mentoring were key components of successful TaRL programs in other countries, TaRL lessons were monitored by Fellows and head teachers, with extra mentoring provided by government teacher trainers called Center Coordinating Tutors (CCTs). By integrating local volunteers, teachers, and CCTs into our TaRL program, we aimed to develop and test a sustainable, community-led approach which could continue even after a Fellow has completed his or her two-year term of support. The TaRL literacy approach was tested at 9 Building Tomorrow schools and one Building Tomorrow government partner school and involved 448 second and third grade students. In a nutshell, we found that the TaRL approach led to remarkable gains in student reading outcomes in a short period of time (just 25 days). Before our TaRL intervention (baseline), 85% of students were found to lack basic literacy skills, thereby placing them in the Beginner Level. CEVs and teachers then collectively spent over 1,200 dedicated teaching hours aimed at moving students from the Beginner Level to greater fluency. By the end of the program, 78% of those who commenced the camp at Beginner Level had moved up at least one level, with 25% of total students achieving the ability to read and comprehend a short story, qualifying them as “graduates” of the TaRL literacy program. In other words, the vast majority of students were able to jump up a literacy level in just a few weeks. *Note that 9% of students were absent for Week 6 testing. What are the implications of the pilot study, and what are Building Tomorrow’s next steps? Ultimately, Building Tomorrow hopes to reach the 700,000+ children throughout Uganda who remain out-of-school, as well as the millions of students who are currently in school, but are not learning foundational skills. We believe if our Thriving Schools Program model is scaled throughout the government school system, it can ensure access to inclusive, quality education for millions of primary-age children throughout Uganda. These results suggest that the incorporation of the TaRL approach into our Thriving Schools Program model could make our efforts to link children with quality education even more robust. Already, the Ugandan Ministry of Education and Sports (MOES) has taken interest in the work of Thriving Schools and specifically the recruitment and deployment of CEVs. There is interest in evaluating the prospect of nationalizing this part of Building Tomorrow’s model, which would give rise to a grassroots, nationwide volunteer corps with the sole goal of ensuring children are not only in school, but learning, too. We remain committed to putting the child first, and to investigating the application of evidence-based approaches for improving learning outcomes in Uganda. As a result , we are planning to scale up TaRL lessons to 400 schools supported by 100 Fellows in 2019, allowing us to serve an estimated 40,000 students with critical support to develop learning outcomes. Click here to download the full Executive Summary of our pilot results.